As a parent of a child with a severe disability, I know how much time and effort is invested in therapy. 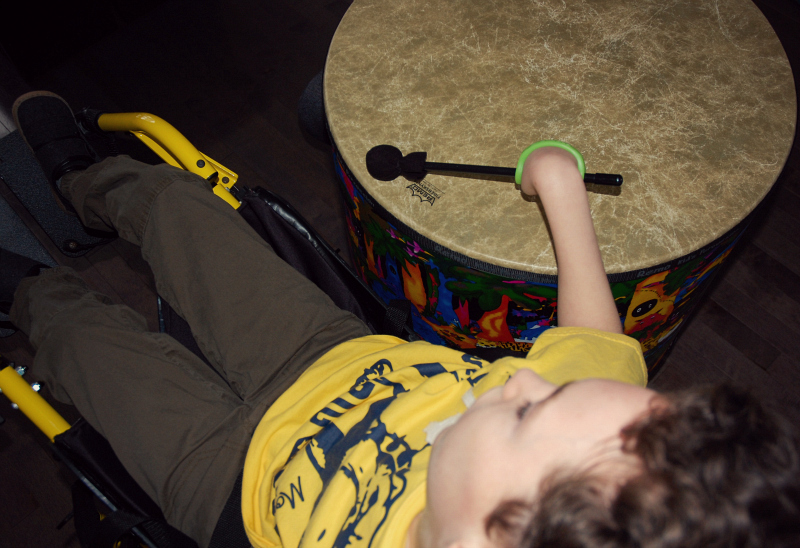 When Brennen was younger, we spent much of our time at physiotherapy, occupational therapy, and speech therapy sessions. As part of an Early Intervention Program, these sessions are vital to children with special needs. I was willing to do anything and everything to help my child progress, so like most parents, I supplemented my son's schedule with music therapy, art therapy, hydrotherapy, hippotherapy, and anything else I could find that had the word "therapy" attached to it. Structured therapy sessions are important, sure, but I am also aware that as parents, our role in providing real life experiences and opportunities for participation in everyday activities and providing support in areas where they need it is perhaps the most critical part of their development. Brennen has poor fine motor skills and very little (basically no) grasping ability. 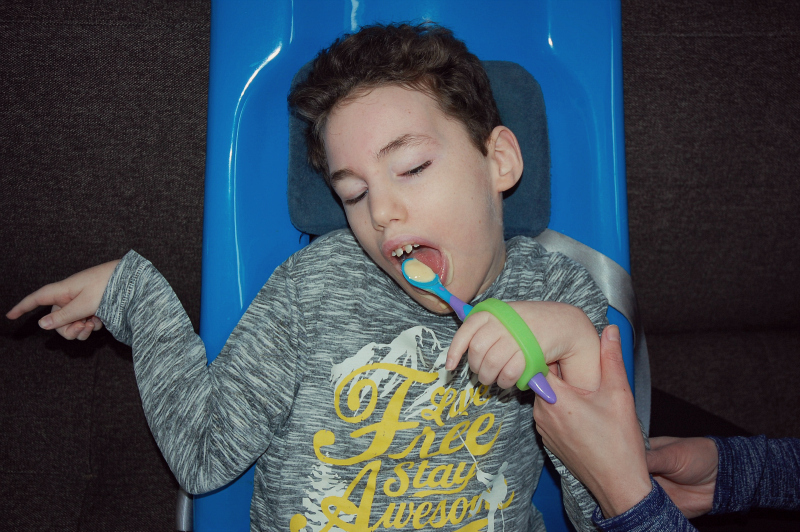 We have tried many different types of adaptive devices and specialized equipment to help him hold on to toys and other objects to give him a little bit more independence, but we hadn't found anything to be overly successful for us until I discovered the EazyHold. We know so many children and families who could benefit from this product, and I am excited to share it with you guys here today! 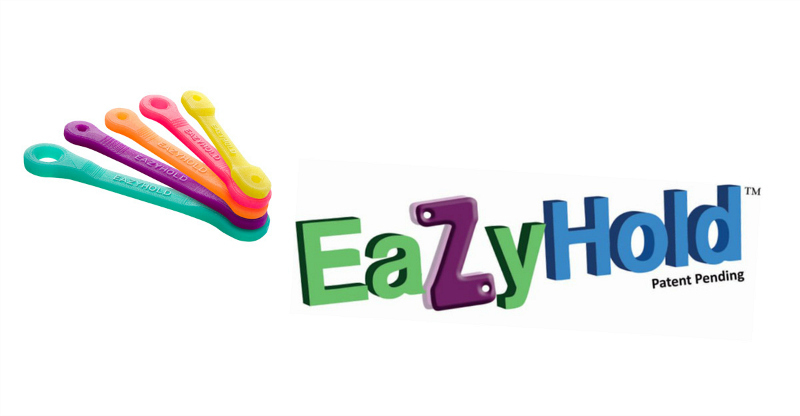 EazyHold is an innovative universal cuff that easily attaches to tools, toys and utensils to support the hand and fingers and help relieve the stress and fatigue associated with tool use. It is made with one piece of flexible, stretchable, soft-yet-strong FDA food grade silicone, and can be used by people with little or no grip strength. The EazyHold was developed by three sisters who were discovering that many tasks around the house and garden were becoming a challenge because of the arthritis in their hands. All of the activities that needed a continuous grip that they did so effortlessly when they were young were now becoming difficult and painful. They wanted to continue to be active, and needed a solution. "Frustrated one day while sweeping out the barn, Kerry had to resort to making a duct tape loop on the broom handle to finish the job without pain. Wondering if there was any kind of an easily attachable soft strap to help her get a grip on the handle of her broom and rake, her search proved fruitless... there wasn't anything! Enter Merrily and Wendy - her two very crafty sisters who brainstormed to come up with a solution to this problem. We knew there had to be a better way. We were familiar with the previous generation of grip assistive straps, as we'd done volunteer work in therapy centers before. 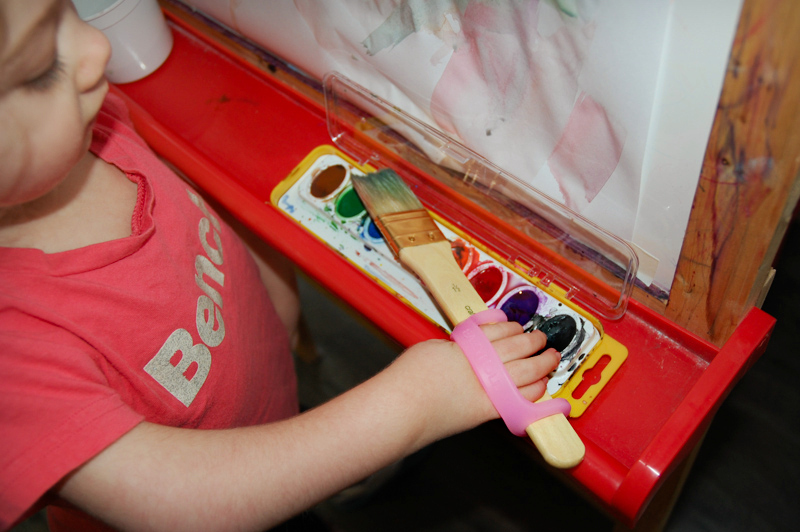 The standard assistive devices are made of elastics, leather, plastics and hook and loop. They are scratchy, uncomfortable, bulky and unsanitary. We wanted to make something more comfortable, hygienic, adaptable, attractive and more affordable. So we decided to head in a new direction: a comfortable, colorful, silicone strap that could fit on virtually anything! We explored different rubber materials, shapes and sizes. Made the molds and poured the first rubber prototypes ourselves in our kitchen. We put them on a variety of objects and headed to the Ventura flea market for a little customer feedback. What we never could have imagined was the extent of the need beyond our own arthritis. The people passing by gave us suggestion after suggestion of what they would put an EazyHold on. Like the man who wanted to put one on his paint roller, and the nurse who needed one for her tiny patient's spoon and rattle. And later, in visiting with therapists, hospitals and convalescent homes, we learned that our simple, inexpensive EazyHold straps could become a valuable resource for those with Cerebral palsy, Stroke, Parkinson's, ALS, Spinal cord injuries, and many more individuals with special needs. Imagine the joy we felt to see a baby who was unable to grip, now holding a rattle for the first time, marveling at it. The outpouring of thanks from parents who have children with disabilities has been unbelievable. Their gratitude makes our journey so exciting and meaningful. We never could have thought the need would be as great as it is and we are motivated every day to get our product out there to those who need it!" 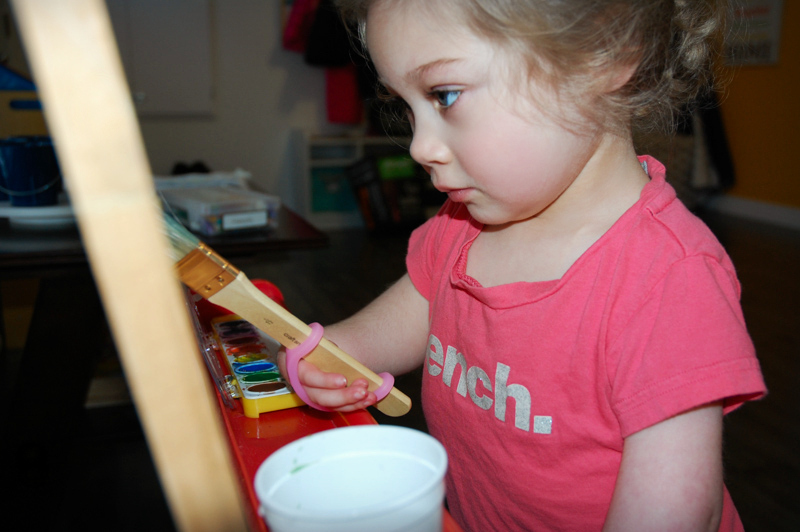 We have used the EazyHold on objects such as crayons, markers, drumsticks, shakers, a paintbrush, Brennen's spoon, his toothbrush, and some small toys. 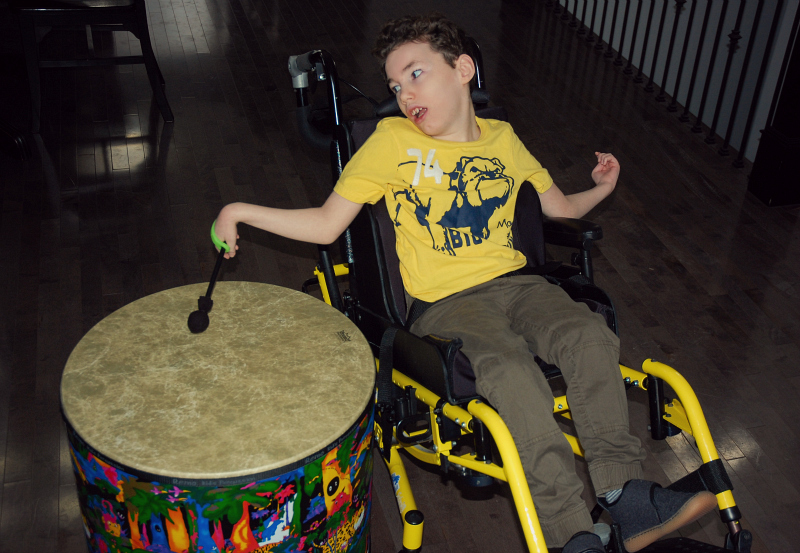 Here is Brennen rocking out on the drum - holding on to the mallet all by himself and tapping away with no assistance! 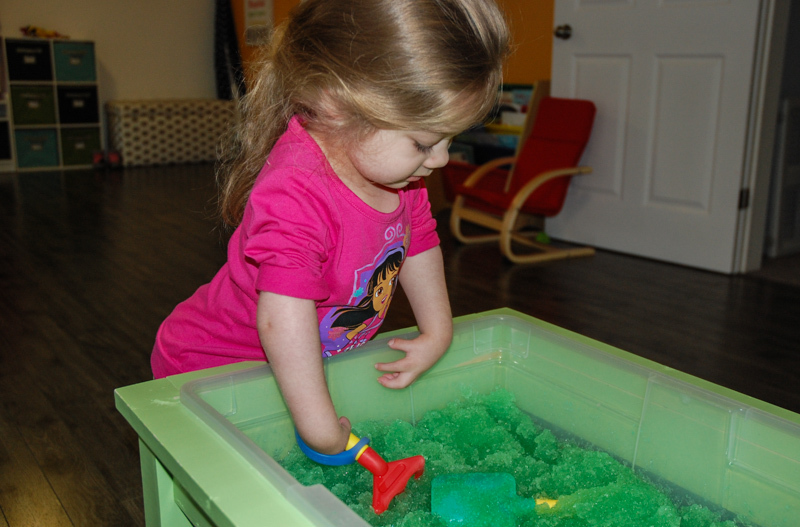 ..and using the shovels and rakes to explore our sensory bin! Children with physical disabilities are children first. Like all children, they need opportunities to make choices and do things for themselves, within the limits of their ability. We have found so many uses for the EazyHold! It will be of great benefit to Brennen, and to many of the children in our child care program. Unlike other devices we have tried that can be bulky and uncomfortable, the EazyHold still allows the individual to feel the sensation of the utensil in their hand. They are perfect for use at home or at school, and will come in handy for lots of different activities. Doing things independently helps build self-confidence, and that can make a world of difference to a child with special needs. Hi Jane! We have the Infant to Youth 5 pack (link below), and it is great to have a selection of sizes. I guess it depends of the size of your child's hand, but we tend to use the green one most often with Brennen. It fits on a lot of common objects. Our friend Ava uses a smaller one - the pink one mostly. The holes are very stretchy and can accommodate a wide variety of tools. We love them!